Chuka Umunna has served as Labour MP for Streatham since 2010. Recently in the June 2017 General Election, Chuka received 38,212 votes, which equaled a 68.5% majority, retaining his seat. Born and raised in Streatham in 1978 Chukka went on to study Law at the University of Manchester. Chuka is a specialist employment law solicitor by profession. He previously worked in a Central London law firm where he primarily acted for employees but also employers. In addition, he is a board member of Generation Next, a not for profit social enterprise which provides activities for young people in London, and has been involved in charitable youth work in Lambeth, too. Chuka was Vice Chair of Streatham Labour Party from 2004 to 2008 and has held a variety of positions throughout the local party. He is a member of the GMB and Unite trade unions and sits on the Management Committee of progressive pressure group, Compass. Chuka is a board member of Generation Next, a not for profit social enterprise providing activities for young people in London. He was formerly a trustee of the Anthony Bourne Foundation and the 409 Project, and has also served as a school governor of Sunnyhill Primary School and Children’s Centre in Streatham. As a person of Nigerian, Irish and English descent, Chuka would become the first person of Black parentage to represent one of the three parliamentary constituencies covering the Brixton area. Aged 35, he is one of the youngest MP's in the capital and the country. 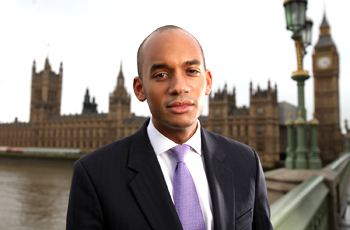 Chuka was elected as MP for Streatham during the 2010 General Election, winning with 62.8% of the popular vote. He has served as Shadow Secretary of State for Business, Innovation, and Skills, and Shadow Minister for Business, Innovation and Skills.